There's a bottled water here called Boquete Springs or some such thing. 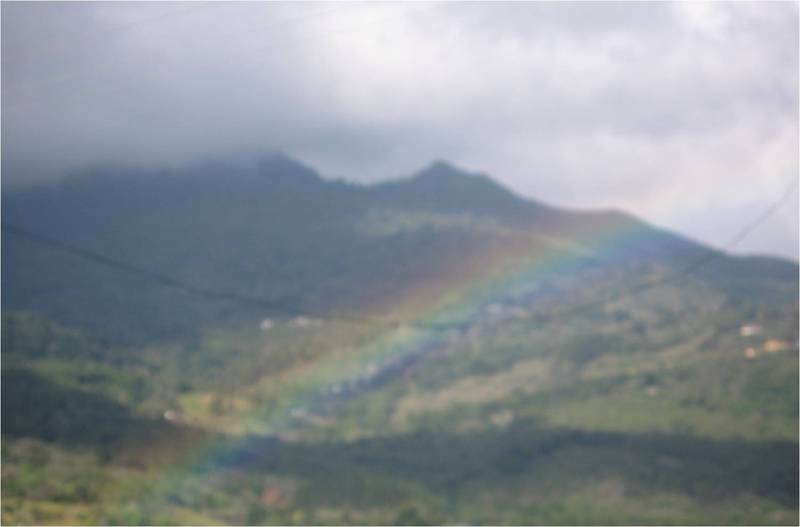 The bottle boasts a picture of a mountain with a rainbow in front of it. It caught my eye because of it's high cheese factor, but thought nothing more of it. Until the bus from David drove into the edge of the city. We saw this. I wish I had a better picture of it. Jen has one. I'll have to get a better one. One where it's not just one small piece of one rainbow but an entire arc through the sky or even two rainbows. We stayed an extra day so we could go on a Jeep tour of the mountain with Boquete Mountain Safari Tours lead by the indomitable John. 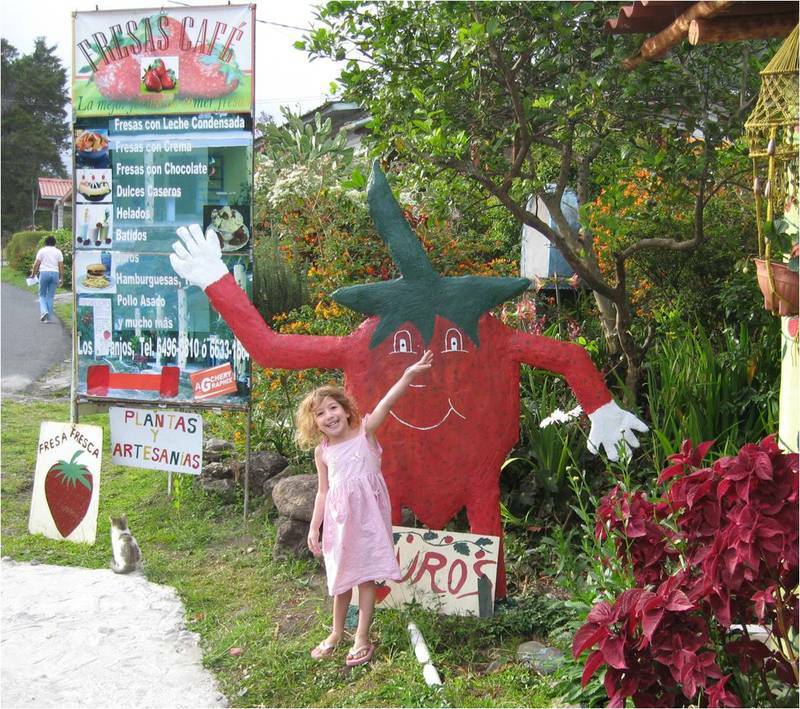 We drove through the town into Volcan Baru National Park to the Sendero de los Quetzeles, going through fields of potatoes, carrots and other vegetables. 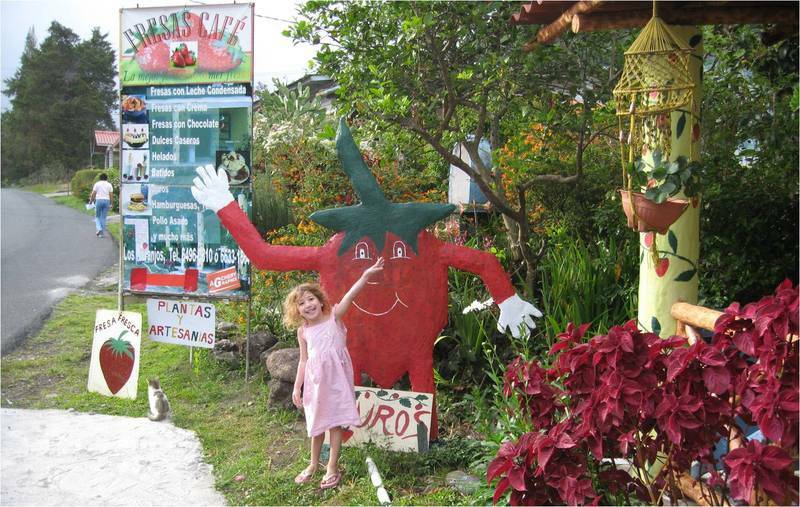 Oh, and of course, through the coffee plantations Boquete is known for. We visited Cafe Ruiz and passed Mi Jardin es Su Jardin, a private garden opened to the public by the owners. The Rio Caldera runs through this town and there are daily tours that take you to the Caldera hot springs we visited back in January when we first drove up through Chiriqui to Almirante. John kept us entertained with his endless stories of all sorts of things. A veritable database of information pertaining to all things factual and personal. Personal? You ask. Read on. I'll get to it. He told us Kroger's, you know, the giant supermarket chain is planning to buy it's vegetables from Boquete. He told us about coffee that costs $500 a pound. Black Gold! He took us to Devil's Peak, where it is always cloudy because it's so high up in the mountains. He pointed out the hills where supposedly vast amounts of marijuana grow. He showed us how he stands on the back of the Jeep drags his feet on the ground while in motion and apparently can do so at speeds of 40 miles an hour. He used to live in Tennessee where he was married and had a kid but found out the kid wasn't his. There were also two women who joined us on the tour who he said were training to be guides. Maybe. Perhaps. And I'm pretty sure one of them is dating Raoul, the driver, also John's brother, from another father. Their mother practices herbal medicine, and he lived in Nashville the last 18 years. He stopped the Jeep and pulled a couple Valerian plants for me. They're known to be a nervine tonic and are also found in the United States and many other areas. And finally, he picked a couple of Angel Trumpet flowers, explaining how if you make them into a tea, you can get high, baby, yeah, real high. And by the end of the day, our heads were spinning with information. I looked up the Angel Trumpet and it is indeed a very powerful hallucinogenic. In fact, the entire plant, leaves, flower, stem and roots, is highly poisonous. The vervain he gave me, however, is nothing like any form of vervain I've ever seen before. Not in the northeast US woodlands and not in any field guide of seen of plants, including a Panamanian guide to plants Noah found at STRI. Who knows how much he told us is true? Who cares? We were infinitely entertained the entire five hours of this trip, and at the end, he treated us all to strawberry milkshakes and ice cream at a Fresas Cafe. After Boquete, Jen and I took a bus to Panama City where we had one full lovely day together to walk around. We visited Casco Viejo and all the museums around Plaza de la Independencia. The Emerald Museum. The Interoceanic Museum and the Cathedral. We then walked from there up Avenida Central to Calidonia. This is the exact walk Noah and I took our first day exploring Panama. Of course, then, we were lost and had no idea where we were going or what we were doing. I think we were also half asleep from traveling and dazed by suddenly landing in a new country, another new country. Then Jen went to the airport, and Melissa drove me to Allbrook bus station (and may I add, she got me there faster and through areas of the city I bet most cab drivers don't know) where I made it just in time to make the bus nocturno back to Bocas.